The global semiconductor market will reach $408.6 billion this year – 20.6% larger than in 2016 – reports market data firm World Semiconductor Trade Statistics (WSTS). This surge is on account of high-speed data processing and the dawn of networked devices which has kept the semiconductor industry ballooning to nearly 30% since late 2015. The tally – about $30 billion more than WSTS had forecast in June – would mark both the first annual total above $400 billion and the first double-digit annual growth since 2010. The semiconductor market has been grown nearly continuously since 2013, thanks in large part to the spread of smartphones and growth in memory technology. The rise of video content, in particular, has stoked demand for semiconductor memory in data centers and smartphones themselves. New uses for memory are also taking off, pushing WSTS to upgrade its forecast and sustaining market growth. IoT devices alone are expected to number more than 1 trillion units. Nikkei Asian Review contends that chip demand from this technology could even exceed that from the 1.5 billion smartphones shipped each year. Cars, meanwhile, will become “data centers on wheels” as self-driving vehicles hit the roads, said Doug Davis, head of Intel’s automated-driving group, in February. Automated driving depends on processing massive amounts of data from vehicle-mounted cameras in real time – a feat requiring both high-performance processors and around 1 terabyte of storage. 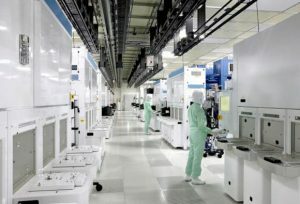 Chipmakers are thus adding production capacity to meet this anticipated jump in demand. U.S. research firm IC Insights sees $90.8 billion in capital investments this year, or 35% more than in 2016.